JDM STI GDB Version 8 Impreza door cards with blue inserts, fits 02-07 Impreza sedan and wagon. JDM BG BD Subaru Legacy stainless steel front and rear door sills with "Legacy" logo. Fits 95-99 Legacy. RARE JDM EK9 (96-00) Civic Type R red main carpet complete. 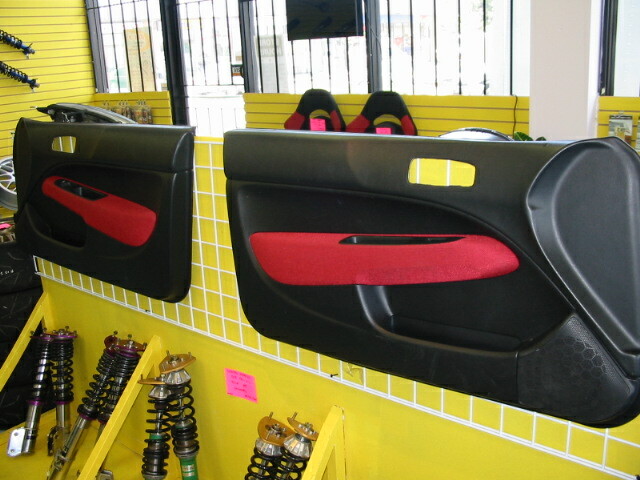 Rare JDM EK9 Civic Type R red door panels, fits 96-00 2dr or hatch backs. JDM Integra Type R (DC5/RSX) doorsills. One pairs ONLY!! !